As the Obamas delivered newfangled gifts to Queen Elizabeth, the G-20 finance ministers and heads of state were sharpening their claws in preparation for a spending vs. regulation cat fight. Quoth Sarkozy, “Miaou.” Now that all the fuss seems to have simmered into a compromise to spend $1 trillion and impose stricter regulation measures, we’re all left to ponder — who exactly is the G-20, again? Are they related to the G-7? And what’s with the G-8? The G-20 (or Group of Twenty) was established in 1999 as a forum for finance ministers and central bank governors of important industrialized and developing economies to discuss hot topics in global economic policy. It was created as a response to the financial crises of the late ’90s and a realization that key emerging markets needed to be included in decision-making. Like any new endeavor, there were a few false starts, with a G-22 conference and a G-33 conference. Even “G-20” is a bit misleading in its name (economists fudging the numbers — surprise, surprise). The G-20 actually consists of 19 member countries and one representative from the European Union, as well as power players from the IMF and the World Bank. The nations are: Argentina, Australia, Brazil, Canada, China, France, Germany, India, Indonesia, Italy, Japan, Mexico, Russia, Saudi Arabia, South Africa, South Korea, Turkey, the United Kingdom and the U.S.A. The countries were selected on the basis of their significance for the international financial system — as well as geographic location and population representation — and the member countries have remained the same since the G-20’s inception. This year, the chairmanship is held by the U.K.; South Korea takes over in 2010. With no permanent staff, it is the chair’s responsibility to establish a pro tem team to organize the summits. Continuity between meetings is maintained by a managing body called the Troika, made up of the past, present and future chairs — who no doubt go on to teach Ebeneezer Scrooge a lesson about the true meaning of Christmas. Normally, the G-20 meets annually to consider policy challenges and options. In the increasingly grim global economic climate, country leaders have now joined their financial policy wonks on two occasions in the past 6 months. While the G-20 incorporates developing economies, the G-7 is a forum of only industrial economic powers: Canada, France, Germany, Italy, Japan, the United Kingdom and the United States. 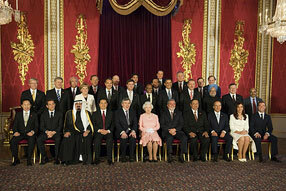 The G-8 consists of the heads of state of the G-7 nations, as well as Russia. Macroeconomics is always on their plate, but in recent years the discussions have expanded to incorporate issues like energy and terrorism. Enough G’s for you? I suppose we’ll leave the G-5, G-10, G-15, G-20, G-24, G-30 and G-77 for some other Friday….